Our facility is completely unique and can offer you the top-notch, full-service event venue you cannot find anywhere else in the Midwest. We are passionate about customer service and excel at what we do. Once you arrive, you never have to leave as everything needed for your special event or meeting we can do. 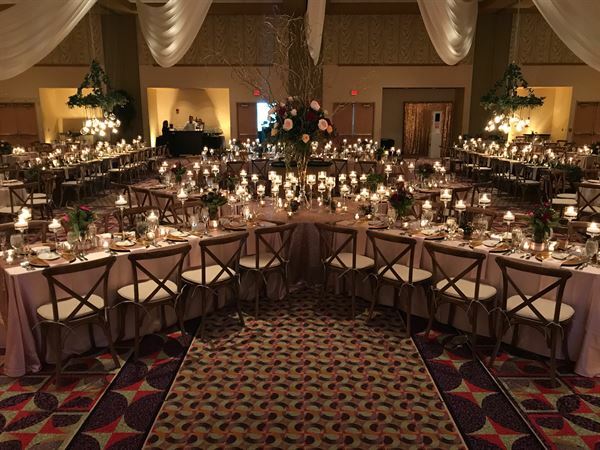 Whether you need a large ballroom or smaller breakout spaces, the 12,420 square foot Event Center has the flexibility to meet the needs of any type of event. Bring your next banquet, conference, trade show, meeting, wedding, anniversary dinner, golf outing or other event to us and we'll do the rest. At Riverside Casino we offer a unique, one of a kind and customized experience for groups of all sizes. Combine the Event Center with all the other amenities and attractions of Riverside Casino & Golf Resort® and you have the ideal destination for yourself and your guests. Whether you need a large ballroom or smaller breakout spaces, the 12,420 square foot Event Center has the flexibility to meet the needs of any type of event. We will work closely with you to coordinate every aspect of your event - catering, accommodations for guests, even entertainment!